Thus far, I have exhausted the soup and mashed potato options in the hospital cafeteria. I’ve also tried to get a little more creative at home to incorporate greens and veggies. I tried this New York Times recipe for a broccoli-chickpea puree (think of it as an alternative hummus), which was moderately successful BUT a bit runny because I didn’t drain my chickpeas. I also used the recipe from the Minimalist, aka Mark Bittman, for lettuce soup. Again, I deviated from the recipe and regretted it. Learn from my mistakes people: Do not substitute whole milk for cream, especially in a lettuce-based soup. Also, I noticed that even after pureeing, there were some little tiny stringy bits, which are unpleasant to slurp down. I had great success with scrambled eggs with a light sprinkling of herbs and polenta (sliced into rounds, then heated in a pan with some butter) topped with freshly grated parmesan. Finally, I leave you with a recipe for not-quite-ratatouille, which was definitely soft enough for me to nibble on after I let it simmer for about an hour. This serves two, but it’s easy to multiply the ingredients as you need. Heat a tablespoon of olive oil in a medium saucepan. Add potatoes first, allow to cook for about two minutes. Next add onion and allow to become translucent-ish, then add zucchini. Add mushrooms last, then salt, pepper and herbs de provence to taste. In hindsight. some garlic would also have been tasty. Lastly, once all ingredients have softened in the pan, add the tomato sauce and stir to coat everything. At this point I also added about a 1/4 cup of water to increase the softness and prevent sticking on the bottom of the pan. I let things cook on medium for about 15 minutes, then turned the heat to low and let it go for up to another hour (if you like your veggies a bit firmer, then you could stop this much earlier). 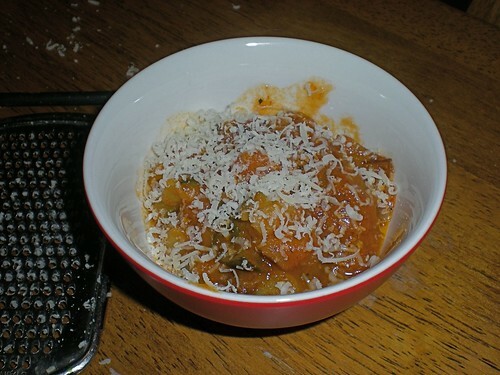 Serve in a bowl and top with grated parmesan. Done and yum.